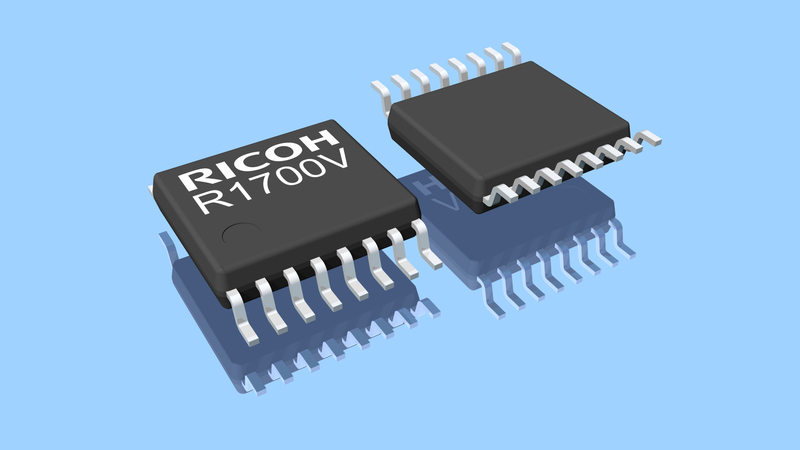 Ricoh Electronic Devices has launched the versatile R1700 LED driver controller. Designed to use in LED lighting applications and including features such as power factor correction, the controller boasts low EMI emission by zero voltage switching and various safety protection circuits. As Ricoh expands its portfolio of ICs targeted for LED lighting applications, the R1700 is a brand new product which is powered directly from mains and converts its primary power source into a voltage suitable to drive LEDs. The IC is optimized for non-isolated LED driver circuits and has a wide input voltage range up to 650V to tolerate peaks in the supply voltage caused by switching inductive loads and to have enough safety margin. A conventional LED driver circuit usually consists of two switching DC/DC Converters whilst Ricoh’s solution uses a unique one stage switching conversion with an advanced buck-boost (inverting) topology. Additionally, an edge resonance controlled Zero Voltage Switching (ZVS) circuit allows a high operating frequency. These two features accept the use of smaller and less bulky components which makes the application suitable for integration in regular but also small and thin sized lighting fixtures. Compared to conventional circuits, a board-space reduction of 70% and height reduction of 50% can be achieved. A second significant advantage of Ricoh’s approach is that the electronic circuit emits considerable less EMI noise. Ricoh’s R1700 is a high efficient Power Factor Correction (PFC) controller with ZVS, which significantly reduces the switching loss and switching noise generated by synchronous rectification. The PFC circuit improves the ratio between active and apparent power resulting in a lower load current from the source (energy supplier). The LED brightness level can be dimmed from 100% to 5% by connecting a PWM signal to the DIM input. As an alternative option one could consider adding the R1580 constant current driver into the circuit. This IC converts a PWM signal into a linear dimming signal, the main advantages of this method is that the LED driver MOSFET is not continuously switching which supresses the harmonic current and EMI emission and results in a flicker-free LED operation. Especially when the light source is used for recording photos and videos, the resulting footage quality may be effected by flickering illumination. Striking effects are areas or lines on the footage with a different exposure. Another advantage of the R1580 is its wide dimming range, it extends the standard range from a minimum setting of 5% to 0.5%. In particular for RGB LED configurations, the extended dimming range ensures a wide control of the colour temperature settings.